It is time for me to share with you the story of Jimmy. 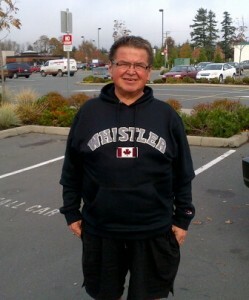 He is a respected leader among the Kwakiutl people of Vancouver Island. He is educated and cosmopolitan while also remaining down-to-earth and connected to his home community. He is a bright, intelligent and good-hearted man. I am honoured to count him amongst my friends. Not that long ago he was also a classic example of the devastation that metabolic syndrome and type 2 diabetes are wreaking in the Canadian Indigenous population. At 48 years of age he had been taking insulin for 17 years. Even with four shots a day of two types of insulin he was not able to get his soaring blood sugars under control. He was medicated for high blood pressure, which also remained stubbornly high. His lipids were bad and his doctor wanted him to start taking a statin. He was significantly overweight and had already suffered from a stroke. He was definitely on track for a bad outcome and likely sooner rather than later. At that time, I was speaking out about my own diabetic experience where I had corrected everything in very short order by simply removing carbohydrates from my diet. When addressing a First Nations audience, I would draw parallels between my modern low-carb diet and their ancestral diet which was very low in carbs in this part of the world. Jimmy heard me give this talk a couple of times and then the penny dropped. He decided to try eliminating carbs from his diet. He went to his health centre and got weighed and measured and then he started sending me email updates. I got the first note after two weeks and he reported that he had lost 17 lbs and was now getting normal fasting blood sugars and had stopped taking insulin. Completely. Consider that for a moment. Years of struggling to control blood sugar with heaps of insulin, injecting four times a day, and failing. And now, after one simple dietary intervention, he is completely free of the needle and running normal values. A couple of weeks later, he reported a total weight loss of 31 lbs and was now normotensive and free of his antihypertensive drug. At nine weeks, he had lost 37 lbs and was continuing to record normal blood pressure and blood sugar readings. At 18 weeks, his total weight loss was 46 lbs and all his markers were normal on no medications. He had his lipids done and those were also within normal range, now, as well. I asked him if he had exercised as part of this intervention and he said “no”. All he did was take starch and sugar off his plate. And he did this without any books, videos or coaching. At this point, he was still very overweight, yet he was metabolically normal. That was seven years ago. In the ensuing interval, he has been able to maintain normal cardiometabolic markers as long as he complies with his carb-restricted diet. Apparently there have been a couple of instances of relapsing to a carb-rich diet with predictable results. He reports that the first thing he notices when he eats carbs is that he is suddenly hungry all the time. Then everything goes sideways. His BP goes up along with his blood sugar and his weight. Then, once he gets back on the diet, everything normalizes again. What I find really remarkable about his story is how clearly it defines the fact that type 2 diabetes is a food intolerance. He has an intolerance to carbohydrates. When he eats them he gets into all kinds of metabolic trouble. When he avoids them, he is fine. When I trained to be a doctor we had a lecture on how you diagnose a food intolerance. That is how it is done. Jimmy is intolerant of carbohydrates and so is everyone else who has diabetes and, I would argue, metabolic syndrome or any other manifestation of insulin resistance. The excellent series of studies done by Jeff Volek at the University of Connecticut have demonstrated quite clearly that all the features of metabolic syndrome get better on a low-carb diet. Eric Westman at Duke has published evidence that type 2 diabetics do very well on a low-carb diet, much better than on a low-glycemic index diet or a conventional diet. Others have published similar findings in the past, Frank Nuttal and Mary Gannon at the University of Minnesota, for example, who showed that type 2 diabetics can achieve normal blood sugar control by simply restricting carbs and that this can be done in the absence of weight loss. So the evidence is out there and has been for awhile. Yet, we have a medical establishment that insists that people with profound manifestations of this food intolerance should eat more than half their calories from the very foods they cannot tolerate. And to accomplish this, that they should take a plethora of medications and eventually start injecting insulin, as well. I was in Denver last week at the annual conference of the Nutrition and Metabolism Society. One of the speakers was a professor of nutrition and medicine, a high ranking functionary in the American Diabetes Association and somebody who is directly involved in producing the guidelines that I find so perverse. I was the moderator of the session in which she spoke and was invited to join her, along with Richard Feinman and Eric Westman, for lunch. I think it was perhaps a little bit inhospitable and maybe even unfair to expect her to defend the whole corrupt edifice of conventional diabetes management but that is essentially what happened as we ate our various salads in the hotel dining room. 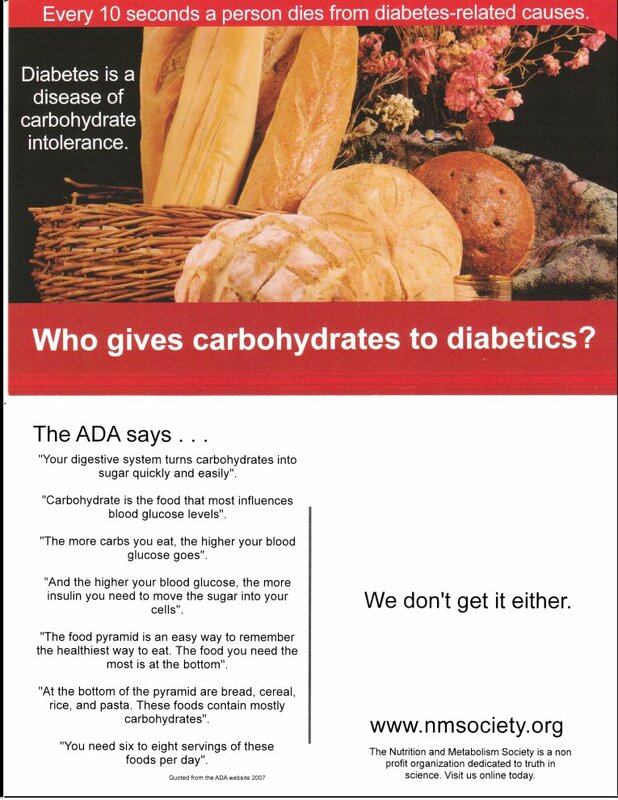 Her position was that the ADA relied on the available evidence to make care recommendations and that there wasn’t sufficient evidence to support a low-carb recommendation at this point in time. Okay, fair enough, I guess. They shouldn’t run off half-cocked and should do their due diligence to make sure the recommendations are soundly based in good science. The problem, however, is more nuanced than that. The problem is that the system is exquisitely designed to protect the status quo and it does this in many ingenious ways. The typical review process will set boundaries in terms of which studies can be considered as valid evidence. A typical requirement would be a minimum size for the cohort studied. Obviously, larger numbers give you more accurate information on whether something works, is safe, etc. so this is done for valid reasons. To a point. This is a big problem for the low-carb studies because the researchers who know how to do a proper low-carb trial, who get good compliance and whose results show the true benefits of the diet have real difficulty getting funded from conventional sources. There is a strong bias against this kind of diet, it is viewed with a lot of disdain among conventional nutritionists and some people think it is downright harmful. Richard Feinman argued that the cut-offs are arbitrary, that there is no evidence that data from a cohort of 10 is any less valid than a cohort of 100. While there is an argument for larger numbers in order to generate sufficient statistical power, he is right in the sense that when the effect size is great (as it is with a low-carb diets) the results from a small number of subjects can be statistically significant and should not be ignored. I would argue that even case studies, like Jimmy’s story, are valid evidence, surely valid enough to justify further research, if not a policy change. Consider Banting and Best. How many subjects did they try their newly discovered insulin on before it became the default treatment for diabetes? How many randomized clinical trials did they run? How many review committees sorted through the studies and generated recommendations? So, my ADA colleague’s response to our pleas for the inclusion of a low-carb diet in the guidelines was easily brushed aside for lack of evidence. The system preserves itself at the cost of how much human suffering? Richard was practically choking on his bunless burger in a fit of apoplexy during this part of the discussion so I whipped out my laptop and pulled up my PowerPoint slides which detail Jimmy’s story. I told her that there was an inexplicable disconnect between the clinical “coal face” and the echelons where research agendas are set and where evidence gets translated into policy. I talked about how his story was not unique, that there are plenty of others like him. Eric confirmed that, in his clinic, he sees these kinds of results all the time. And yet, there is an apparent total lack of curiosity in the research establishment to explore the potential of this powerfully therapeutic intervention. I said that if I had administered a drug to Jimmy to get those results, the research establishment and drug industry would have been all over this in a heartbeat. Richard added that we would all be wealthy from buying stock in the company that brought such a drug to market. She was unmoved. Her immediate response on hearing Jimmy’s story was that “everyone is different”. Her more extended response was that low-carb researchers should continue to submit proposals to the hostile (my word, not hers) review committees and hope to eventually get funded and then included in the evidence that is deemed substantial enough to influence the guidelines. Lunch ended shortly after that and she left as expeditiously as she could without actually breaking into a trot. I felt a little badly that we had thrust the whole burden of defending the indefensible onto her shoulders. On the other hand, I don’t know what else we can do at this point but to shout from the roof-tops that an inherently corrupted establishment is ignoring a simple, safe and effective intervention that has the potential to relieve an enormous amount of human suffering while saving the health care system from bankruptcy, even when the evidence is in their face. At some point there has to be some kind of reckoning, some form of accountability for this enormous malfeasance. I hope I see it in my lifetime. And so, back to my friend, Jimmy. A lot of people will concede that amazing results can be achieved by a low-carb diet in the short term but will argue that nobody can sustain such a “restrictive” diet over the long haul. A few months back, Jimmy sent me this photo along with a report that, after seven years, he has lost another 50 lbs and is consistently maintaining normal cardiometabolic markers on no meds. Have a look and decide for yourself whether this is evidence that a low-carb diet should be considered a valid therapy for metabolic syndrome and type 2 diabetes. How the status quo defends itself (part 3). Both offer good explanations. It’s good to understand this phenomenon because you will encounter this question from believers and non-believers alike. Ski season is winding down. Issy did 25 days. By the end she was getting bored with the usual runs and started demanding to go over the jumps in the terrain park. We looked a sight with her getting a little air on each jump and me following behind hanging onto the tether. Alex and I did about 35 days and had some good double black diamond runs and I was able to shave another minute off my Peak to Creek time. Here is the latest – 7 km in 5 minutes for an average speed of 84 kph (52 mph). I added some suitable music. Enjoy! Who gives carbohydrates to diabetics? The Republicans and Democrats share two key characteristics. The finance industry is the leading political contributor to both parties and both parties’ views of finance are largely shaped by neoclassical economic views that are false, destructive, and so dogmatically held that they have remained immune to repeated falsification by reality. When I read this comment by Prof. Bill Black, an outspoken critic of the out-0f-control US financial sector, it struck me that he is describing a situation very similar to what we see in the nutritional science and agri-food sector. The way that the influence of monied industry interests has distorted the process in their favour at the expense of the general public is eerily similar in both cases, IMHO. We go on clinging to an obviously discredited paradigm in the face of compelling evidence to the contrary while chronic disease rates rise and health status goes into decline. Why? I shall be blogging more on this topic soon.